Ronaldinho de Assis Moreira or more commonly known as just Ronaldinho or Ronaldinho Gaucho was born on March 21st, 1980 (Age 33). Ronaldinho currently plays for Atletico Mineiro a Brazilian football club out of Belo Horizonte, State of Minas Gerias, and also plays for the Brazilian national team as an attacking midfielder or forward. At the early age of 8, Ronaldinho’s soccer skills began to blossom. He gained an interest in playing futsal and beach soccer, but was first noticed by the media in a match where his team won 23-0 and all 23 goals were scored by Ronaldinho. His first big game was in 1997 during a U-17 World Championship match in Egypt where he scored two goals off of penalty kicks. Ronaldinho’s professional career began when he was 18 with the Gremio youth squad, the same club that his brother Roberto had played for. Arsenal noticed the skill that Ronaldinho had in 2001, but ultimately the deal fell through because Ronaldinho could not obtain a work permit as he was a non-EU player without enough international matches to be eligible. Ronaldinho ended up signing a 5 year contract with Paris Saint-Germain in 2001 to the tune of €5 million, was given the number 21, and made his Lique 1 debut on August 4th, 2001 in a 1-1 tie versus Auxerre. He spent the remainder of the season alternating between bench and starting roles, and scored his first goal on October 13th, 2001 in a 2-2 draw versus Lyon. In 2004 FC Barcelona offered Ronaldinho a €30 million offer after failing to pick up David Beckham. Ronaldinho made his La Liga debut for FC Barcelona in a 2-0 victory against Milan in a friendly match at Robert F. Kennedy Memorial Stadium in Washington DC scoring 1 of the teams 2 goals. 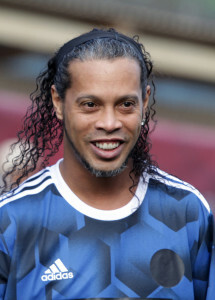 Ronaldinho was injured during the season, but returned to the team during the second half of the season to help FC Barcelona secure a 2nd place league finish. Ronaldinho won his first league title in the 2004-2005 season with FC Barcelona and was named the 2004-05 FIFA World player of the year award on December 20th 2004, and again in 2005. Ronaldinho was offered £25.5 from Manchester City and ended up signing a three year contract with A.C. Milan, an Italian Serie A powerhouse, for approximately £5.1 million a year. Ronaldinho scored his first goal for A.C. Milan in a 1-0 victory versus Internazionale Milano. Ronaldinho finished his first season with A.C. Milan with 10 goals and 32 appearances. His second season with A.C. Milan started off slow but ended up finishing the season as arguably the best player for the team. On January 11th, 2011 Ronaldinho ended up signing a deal to move to the Campeonato Brasilerio Serie A League for Clube de Regatas do Flamengo, a Brazilian soccer club based in Rio de Janeiro. Ronaldinho scored his first goal for Flamengo on February 6th, 2011 against Voavista. On May 31st, 2012 Ronaldinho sued Flamengo claiming that they had not paid him for months and cancelled his contract with the club. He then made a surprise move to Atletico Mineiro on June 4th, 2012 just 4 days after leaving Flamengo. Ronaldinho continues to play for Atletico Mineiro as #10 and plays as an attacking forward/midfielder.